Hippotherapy is a powerful treatment strategy that utilizes the movement of the horse as a strategic intervention to address a variety of disabilities. Hippotherapy, as fun as it may be, does not have anything to do with a Hippo. The word hippotherapy is derived from the Greek word hippos, meaning horse. A licensed and specially trained Physical (PT), Occupational (OT), or Speech Therapist (ST) conducts our Hippotherapy services, in combination with a certified PATH Intl Therapeutic Riding Instructor. During a treatment session, the movement of the horse, position of the client, equipment, and types of activities used are monitored, analyzed, and modified by the therapist to promote the best functional outcomes. Horse movement may be one of many treatment strategies used by the treating therapist. When a horse walks, it mimics the way a human walks. A horse’s stride is similar to the length of a human stride, and their hips move in a similar motion to humans hips. This provides a three-dimension movement (front/back, left/right, up/down) that is difficult to replicate in the traditional therapy setting. For those who are unable to walk or who do not have a sound walk, they can ride a horse and receive the same physical and neurological stimulation walking would typically provide. Riding a horse also helps to open up airways and expand the lungs. This has led to clients who have never spoken speak their first words on the back of a horse. Many of the riders don’t realize that they are in therapy as opposed to traditional physical therapy, which can often be a painful and arduous process for clients. 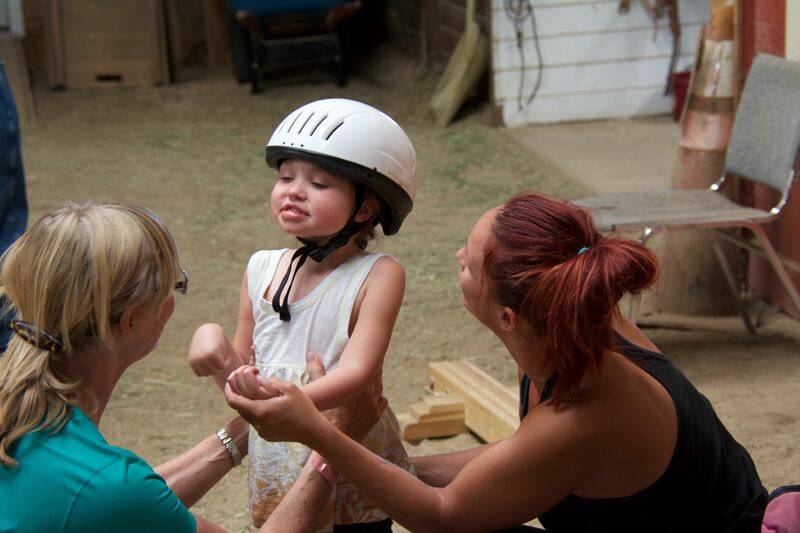 Hippotherapy does not replace traditional therapy, but is designed to enhance it. StableStrides partners with Children’s Hospital Colorado and Memorial Health Systems to provide Hippotherapy Services. Individuals as young as 2 years of age are eligible to participate in this program. Interested in participating in Hippotherapy services at PPTRC or you just want to learn more?